Dynamic seating provides movement within the seating system and/or mobility base. Dynamic seating systems are either integrated or modular. These systems are integrated into the mobility base, meaning that the entire system must be purchased as a unit and cannot be retrofitted to other mobility bases. Integrated systems often provide movement at more than one location of the body, such as the hips, knees and head. Modular dynamic seating components can typically be used on a number of different mobility bases. Movement can be provided at one location, such as the hips, or several modular components can be combined to provide movement in more than one area of the body. In the United States, most dynamic seating options are modular, and nearly all integrated systems are only available outside of the country. One of the main integrated systems available in the United States, the Kid Rock series (currently distributed by Quantum Rehab) is being discontinued. Clients currently using a Kid Rock system will need to explore other options when this system is outgrown or no longer meets an individual’s needs. Daniel had successfully used a Kid Rock 2 for a number of years, but he outgrew this system. The Kid Rock 3 provided the movement that had so successfully controlled his extension; however, this was very wide and the family just couldn’t manage the new wheelchair base. 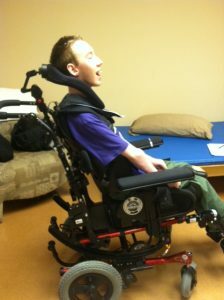 Instead, a standard tilt in space manual wheelchair with modular components from Seating Dynamics at the hips, knees and head was successfully provided.